Fronds are EVERYWHERE this summer and I am loving it. From jumpsuits to candleholders (more on that in a moment) these oversized leaves are showing up in the most unusual of places. Let's first pay tribute to 1942 by decorator Don Loper and others for popularizing the iconic Martinique wallpaper. 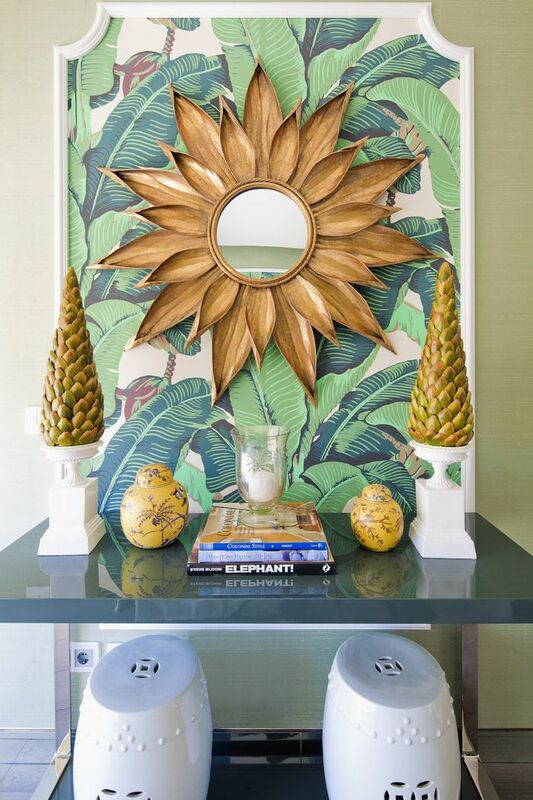 Using a banana leaf wallcovering is a bold design choice that has made the Beverly Hills Hotel a legendary example of chic design over the years. Dorothy Draper decked the halls of The The Greenbrier Hotel in leafy green paper as well during in it's renovation in the 40's (what was it with that decade?). 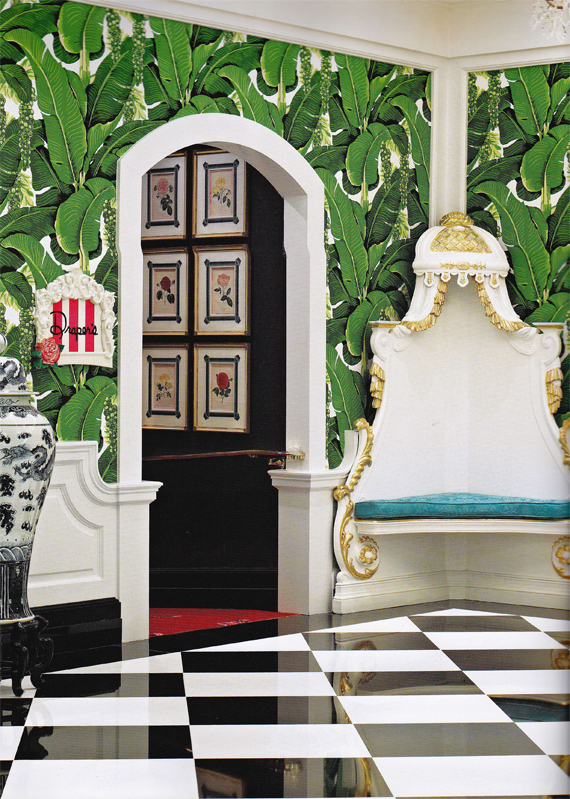 In more recent years, designer Tom Scheerer made waves when he wrapped the walls of the Lyford Cay Club lobby in Quadrille's towering palm wallpaper. The message is clear: palms are cool. Palm leaf prints are even cooler. So today's post is all about working this motif into your life in the most sophisticated of ways. It doesn't need to be a head to toe look, just a hint of a frondy print does a space good. Think: Palm Beach Chic and you've got the right vibe. Personally, I love the look in proximity to the water. If you have a pool, God bless you. This is the moment it will shine! Rocking a waterless patio? Not to worry, these plans will make you feel as though you're lounging at the Beverly Hills Hotel being catered too by their overly-solicitous staff. Now... are you ready to see how I'm suggesting you dress up your dining area to channel that iconic leafy vibe. The key is to have fun and play up the tropical vibe without being terribly overt. The pillows are gorgeous and the dinnerware is CLASSIC for indoor or outdoor use. You will never, ever be disappointed you invested in the Juliska dinnerware. I am obsessed with the brand, so more on that later! Set the tone with the right tunes. Think: bossanova. Think: Bebel Gilberto. Think: chill mode. Now for scent. Yes, I know fragrance and dining are supposed to be mortal enemies. But in this instance I love Nest's Sicilian Tangerine to seal the deal on the tropical vibe. The diffuser (versus a candle) will lend subtle fragrance to the space. Need more help getting in the mood? I have a few books you might enjoy.